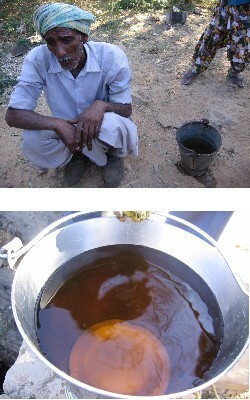 Top: A local farmer affected by the severe water contamination at Bicchadi. Bottom: Colored water drawn from a contaminated well in Bicchadi. Severely contaminated with dyes and chemicals from defunct industries, the drinking water to this rural village has been rendered highly toxic. Blacksmith initiated and supported a stakeholders group in a concerted attempt to design and implement a solution to this problem. As a consequence, a local business group committed to the installation and maintenance of a water treatment system. Bichadi is a small town located roughly fifteen kilometers east of Udaipur of the Rajasthan region, India. This site, which was a small industrial estate (791 acres) manufacturing dyes and dye intermediaries, was ordered closed by the government in 1990, though manufacturing appears to have continued in some plants till 1995. It remains a significantly polluted place due to inadequate remediation post-closure. Indiscriminate surface dumping of sludge, along with irrigation with contaminated groundwater since 1989-90, has contributed to devastating soil contamination. According to the Center for Science and Environment, the groundwater of Bichadi is dark red. Over seventy wells have been rendered unfit for consumption, and around twenty two villages are without local drinking water. Some of the villages’ water needs are met by trucking in potable water, however the trucks deliver only about 10% of the villages’ needs, they can be unreliable, and the current system reduces local autonomy. Additionally, the contaminated water has since negatively affected agriculture through crop failure and permanent loss of fertility to soil. Blacksmith worked in coordination with the NGO ALERT to organize a group of people from various organizations to develop technical solutions to the problem at Bichadi. Blacksmith staff visited the site and met with various stakeholders and became familiar with the issues that surround this site. This visit led to the formation of a stakeholder group that includes representatives from government agencies, Pollution Control Board officials, scientists, NGOs and villagers who will work together to find an appropriate solution to deal with the water contamination. Blacksmith also recommended the site to be included as part of the World Bank program that is scheduled to commence in 2007. Bichadi is analyzing solutions to remediate its groundwater contamination. Severely contaminated with cancerous dyes and chemicals from defunct industries, the drinking water has been rendered highly toxic. This stakeholders group is a significant attempt to design and implement a solution to this problem. The National Environmental Engineering Research Institute has been assigned the task of cleaning the water. This town in Rajasthan is now analyzing solutions to remediate its groundwater contamination. Severely contaminated with cancerous dyes and chemicals from defunct industries, the drinking water has been rendered highly toxic. This stakeholders group is a significant attempt to design and implement a solution to this problem. The National Environmental Engineering Research Institute has been assigned the task of cleaning the water.